In April 2016, Healthcare Business News published an article on the staffing shortage crisis in America. The article suggests that the aging patient population increasing the demand for healthcare services as well as the number of healthcare workers entering retirement age are partially responsible for the shortfall. While the problem exists across the board for nursing, greater shortages have been noted in the operating room, neonatal department, and the intensive care unit. With this workforce challenge, healthcare facilities must find ways to optimize their current resources while maintaining their focus on quality care. Without knowledge of the location, movement and interactions of patients, staff and critical operating room assets, process improvement is virtually impossible. However, with accurate visibility into this information provided by RTLS, the OR can apply sophisticated rules to deliver true workflow automation. In the OR, CenTrak helps to automate manual tracking systems, providing location and time-specific data such as case status, milestones, patient location and department work queues (waiting room, pre-op, intra-op, PACU and post-op). Automating these events, without having to wait for a clinician to update a case status, provides immediate insights into the department – reducing stress, improving efficiency and directly improving the overall bottom line. Surgical departments can also use RTLS to reduce the time spent searching for assets, greatly improving staff utilization as nurses are able to quickly find and stage OR equipment. During operations, environmental conditions must be strictly controlled and certain temperature sensitive materials must be readily available. For example, ensuring that blood is preserved and properly maintained is important as the likelihood for someone to suffer from blood loss during a surgical procedure is increased. By implementing an automated, wireless environmental and temperature monitoring solution, hospitals can take immediate action if blood storage temperatures begin to approach unsafe temperatures. This greatly reduces product waste and safeguards blood inventory levels to ensure it is available at the moment it is needed. In the ICU, having access to the necessary equipment and support staff when a life-threatening situation arises is critical. When staff members are under pressure, they don’t have time to spare searching for medical equipment. Unlike other solutions on the market that estimate distance, CenTrak provides the precise location of the resources they need with 100 percent accuracy. When clinicians can perform their jobs without being interrupted by misplaced equipment challenges, they experience a more streamlined workflow – improving their overall job satisfaction and increasing efficiency. It is also important to note that the CenTrak Staff Badge is used in several applications to automate clinical events and provide 24/7 location alerts for situations requiring immediate assistance. Using wireless call functionality, staff can simply press on their badge to summon for help. In a circumstance where every second counts, the exact location is immediately displayed at the nursing station to ensure quick response times. Additionally, the interoperability of accurate staff location information and existing technologies, such as leading EHRs or Nurse Call systems, has the ability to capture and document clinical events and milestones to reduce manual data entry. This provides enhanced communication capabilities for staff, faster response times for patients, and a more hands-free approach to patient care. On average, nurses walk up to 5 miles per day on the hospital floors. They are called in multiple directions at once and have on average 72 tasks per hour (Westbrook et al. BMC Health Services Research 2011). Their time spent doing paperwork, searching for support staff or assets, and responding to interruptions decreases the time they have to provide direct patient care. RTLS helps eliminate wasted time and increase efficiency to automate workflow processes. 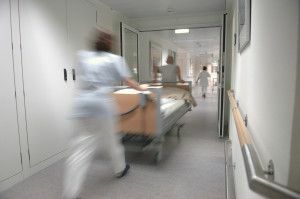 No matter the hospital department, RTLS is a valuable tool that provides more efficient solutions for enhanced patient care.